Blackjack vs. Poker: How Good is Your Poker Face? 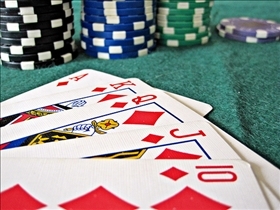 Blackjack and poker are two of the most popular card games to be played in the casinos, whether online or in the real world. Both games attract huge numbers of people anywhere they are played and their popularity reaches near fanatical levels. Blackjack and poker have their differences of course, some of the most significant of which we will cover in this comparison article. Blackjack is a noticeably fast paced game that moves along at a much quicker pace than poker. Each round of the game generally doesn’t take very long to play, and each player will have to make quick decisions in order to keep up with the other players. While there are numerous strategies that can help a player win, they will have to be implemented fairly quickly in order to be more effective. Poker on the other hand involves a lot more focus and concentration, so it is therefore played at a much slower pace. The game also involves a fair amount of thinking, which means that it isn't ideally suited for players that are looking for a quick win. Speaking of winning, this goes by a lot faster in blackjack as well, and simply involves hitting 21 or getting as close to it as possible by beating out the dealer. 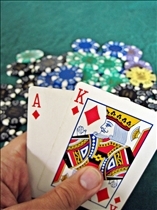 It is important to note that the game of blackjack involves beating out only the dealer, and each player is not in competition with any other player on the table. A poker win happens only once in every playing session, and it is largely dependent on who gets the best hands. Unlike in blackjack, poker players who lose a hand are eliminated, leaving only the other players to continue on until only one player is left. Both blackjack and poker have no shortage of players who are convinced–and are eager to convince anyone who will listen–that there are ways to beat the game. The difference is that the outcome of a blackjack game is usually fixed, which isn't something that can be said for poker. That being said, the longer that you play blackjack means the more chances of the house eventually getting the better of you, so in most cases, it is best to get in and get out quickly. It is important to keep in mind that regardless of the strategy employed in both games, they are both essentially games of luck, which means that whether you win or lose is ultimately down to the cards. Play the game long enough, and your chances of losing to the house go up considerably. Which game do you win more money playing?